I have found a terrific little set of nail art polishes from Simply Spoiled Beauty Products. This set blew my mind. It's a 2 in 1 nail polishes/pens that will help you achieve those fine nail art looks. It comes in a set of a gorgeous rainbow of shades. Everything arrived in a quick amount of time and everyhing was secure inside. So many shades!! So many endless IDEAS for nail art!! Thin brush on one end for painting or lines! 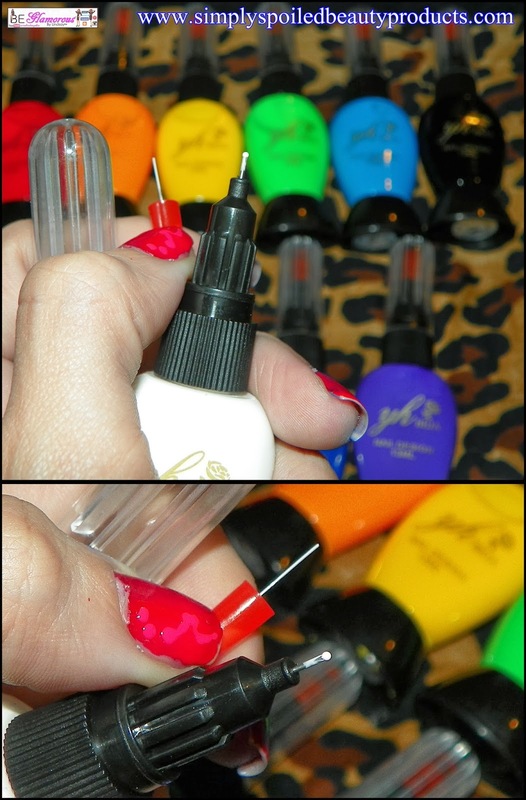 The bottle is squeezable so you can use the dotting pen for more details and dots!! half and without the cleanup of different nail nails too! !